There are twenty-one forms of Tara. The two most important forms are Green Tara and White Tara. 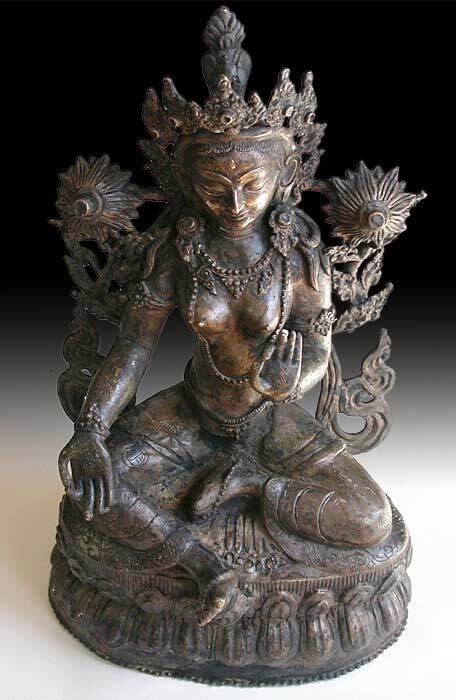 She is a female Buddha and meditation deity. and was believed to be born from the compassionate tear of Avalokitesavara. 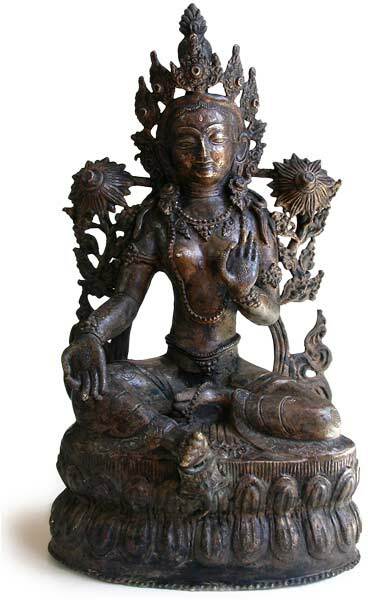 White Tara is the goddess of long life; and Green Tara grants power to overcome obstructions, fears and dangers. Her name "tar" is derived from Sanskrit, which means "to cross over", one who helps sentient beings to cross over samsara (worldly existence). 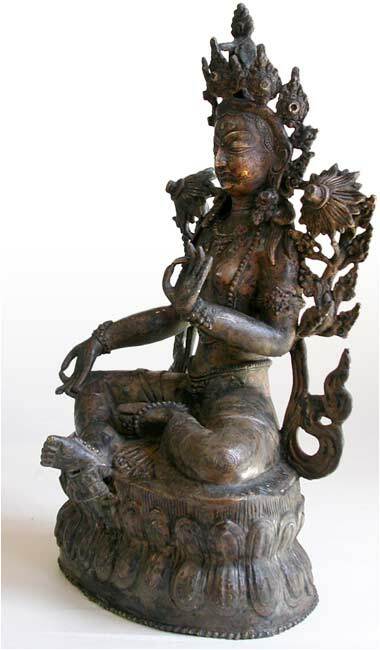 Tara was introduced into Tibet in the seventh century, and became the most popular goddess in Tibet ever since. 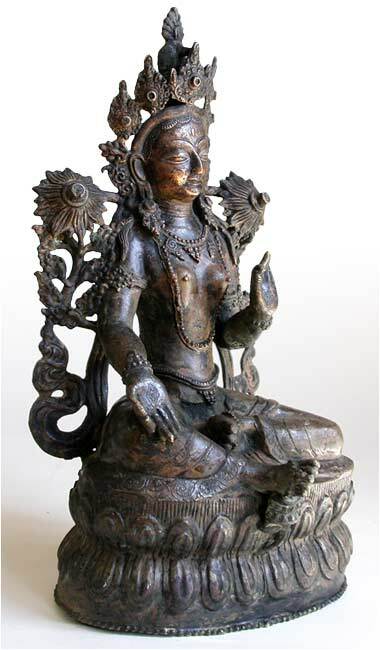 Seated in lalitasala on a double lotus throne, her pendent right foot supported on a padma, her right hand in varada mudra and left hand in vitarka mudra, two lotus flowers ornamenting her shoulders; she is wearing a pleated dhoti, single strand of pearls, arm bands and necklace with foliate ornaments. In addition to the opened base, there are restored openings in the back of her head and body, the jewel stone inlaids that were once on her earrings, lotus flowers and her large crown are also missing. 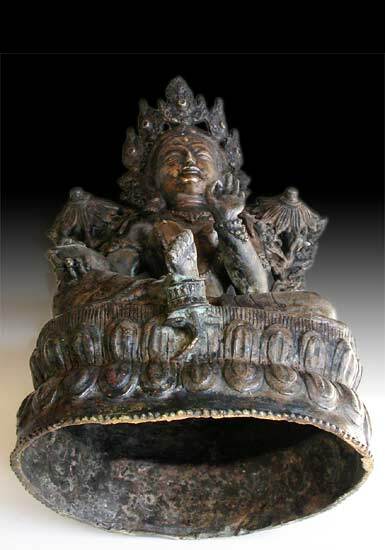 Judging from the hand forged works and incised motifs, particularly the goddess' silver tear-shaped urna, her large almond-shaped eyes and the tall and narrow ridged nose, features that are reminiscent of Indian origin. 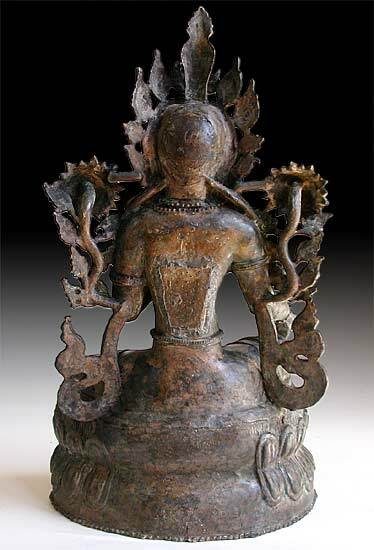 With three Tibetan characters engraved in the back of the statue, this Tara goddess is appeared to be completely absent from Chinese influence; a possible indication that the sculpture was created in 15th century or earlier.